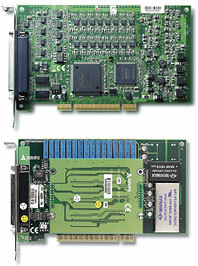 ADLINK PCI-6208 series are 8 or 16-CH, 16-bit, analog output cards. The PCI-6208V-GL offers 8 voltage outputs with ¡Ó10 V range, featuring 15-bit monotonicity and 10 V/£gs slew rate. The on-board analog switches minimize the power-on glitches. PCI-6216V expands the voltage output channels to a total of 16 for higher analog output density requirements. In addition to the voltage output functions, the PCI-6208A features 8 current outputs with ranges of 0-20 mA, 4-20 mA, and 5-25 mA. The daughter board EXP-8A provides high-quality voltage to current transducers. The PCI-6208A device is capable of delivering 14-bit monotonicity with 1.3 mA/£gs slew rate. ADLINK PCI-6208 series devices provide highresolution, high-density analog output functionalities and are suitable for ATE, signal generation, industrial process control, servo control and other industrial control applications. General-Purpose Terminal Board with One 37-pin D-sub female Connector.